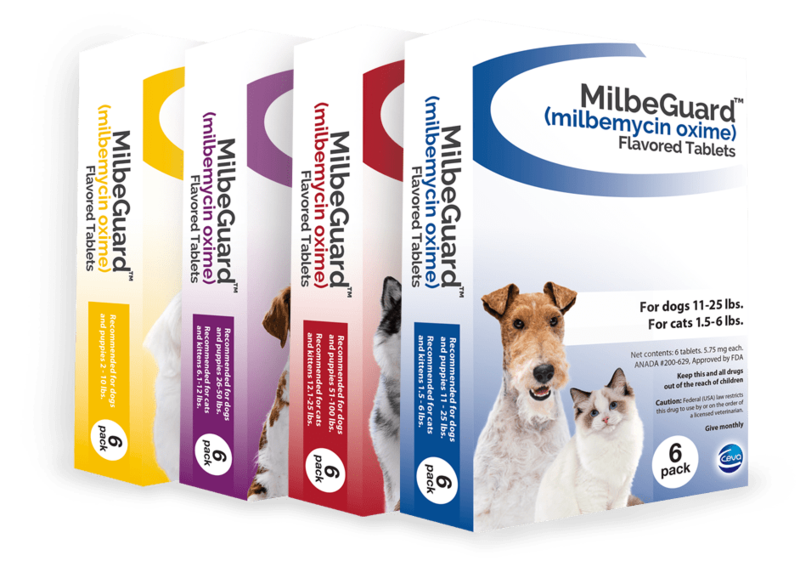 Ceva Animal Health announced (as I reported here first) that they are launching MilbeGuard™ (milbemycin oxime) Flavored Tablets, the first FDA-approved generic heartworm preventive in the U.S. MilbeGuard is a monthly, beef-flavored tablet that prevents heartworm disease and treats and controls whipworms (in dogs only), hookworms and roundworms. While Heartworm disease is totally preventable, this potentially deadly illness is on the rise from 2013 to 2016 by 10 percent, according to the American Heartworm Society. Denial: ‘It won’t happen to my dog’ syndrome. Cost: Of course, the preventive medicine carries a price tag. Compliance: Dog caretakers simply forget (and/or go with fewer doses to save money). Vet visits: Unlike flea/tick products available at pet stores, heartworm preventatives are only available through veterinarians. Without a vet visit, there’s no way to get heartworm preventatives. One reason people don’t visit the vet is to save money. Communication gap: Some veterinarians (shockingly) never even discuss heartworm prevention. To address much of this problem, for the first time ever (in the U.S.), a generic heartworm preventive will be available. Incidentally, we’re going to see more and more generics pop up in veterinary medicine, allowing for less expensive choices for pet drugs. Regarding heartworm, it’s occurring in all 50 states. Due to climate change (and other factors), in some places, there appear to be more mosquitoes that spread the illness. And while heartworm transmission is complex and isn’t infectious from dog to dog; the spread of dogs with heartworm contributes to increasing heartworm. This happens when well-meaning rescuers bring dogs with heartworm into communities. This occurs when shelter dogs or dogs rescued from natural disasters are re-located. We may be doing a good thing, but if those dogs are heartworm positive we’re also relocating heartworm disease. Saving dogs should not end (though rescued dogs should be tested and treated for heartworm), but all dogs should be protected and problem solved.